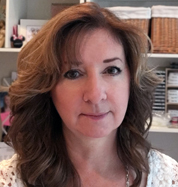 Kraftin Kimmie Stamps has another fun release coming up on Sunday, July 15th! 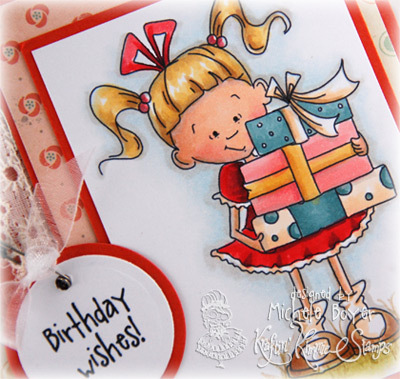 Today the Krafty Girls are sharing samples using Cheryl Alger’s new Birthday Lulu. I colored my image with Copics and hung the little birthday wish in tag form using a small safety pin and scrap of ribbon. You can find direct links to more samples using this set HERE. Don’t forget to leave comments as you look because one lucky stamper is going to receive a free Birthday Lulu set, just for commenting! Stamps: Kraftin Kimmie Stamps “Birthday Lulu” (Cheryl Alger) Ink: Memento Tuxedo Black Paper: My Favorite Things Tangy Orange Replenishments, X-Press It Blending Card, My Mind’s Eye “Nostalgia” (6×6) Accessories: Copic markers (E00, E11, BV000, R20, Y21, E31, R22, R24, R39, BG72, BG75, E50, E51, YR31, BG70, W1, W3), Prismacolor pencils, MFT Circle STAX Die-namics, trim, safety pin, scrap of ribbon. Finished size 4 1/4″ x 5 1/2″. It’s a party on paper! Love how you;ve attached the tag with a safety pin! Gorgeous card! I love the papers and your coloring is stunning. This card is beautiful Michele! I love this birthday Lulu! This is such a cute card! Love your coloring and how you used a safety pin to attach the tag, what a great idea! Pretty card Michele!! I like the layout you used!! That is so darn cute, love the colors and the tag. I have tags and safety pins in my stash I have not used, thanks for the inspiration! She is so cute! Love the colours! whow amazing card Michelle these new Lulu’s are super cute! Love the card! It turned out so sweet! Lulu looks great in red! Really like the “homespun” feel of this card. AWE this is very Beautiful. Love the lace you added to it too!!! 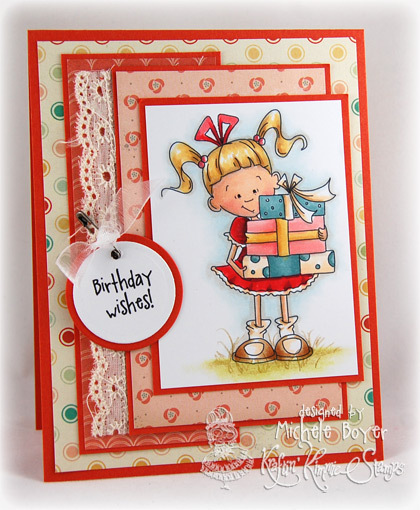 Fabulous layout and gorgeous colouring for a sweet, sweet card! great card love the touch of lace nicely done. This is really adorable. I like the ribbon you used, perfect accent! Wonderfully cute! Super card, I can’t wait for the release..
love these bright colors for summer… so adorable! Adorable Lulu! Love your cute card!! Fantastic card as always. Beautiful colors. Could she be any cuter? I LOVE these Lulus!! !